The NAHB says US tariffs on Canada and China are contributing to the rising cost of building materials. In related news: ABC News reports that December’s housing plummet is due to higher prices and affordability challenges. In company news: Canfor completes its Swedish acquisition; Cascade closes two paper machines in Ontario; Mercer is a top Alberta employer; Westview’s pellet fire impact; and West Fraser hosts Trades Day in Quesnel. In other news: SAPPI joins the Sustainable Apparel Coalition; Washington State University on heat-treated wood and recycled carbon fiber; WoodWorks US announces its design winners; rebuilding the Alberta boreal forest after mining; and carbon black is dissed as green(wash) in BC. Finally, biocontrol measures approved in NZ’s beetle battle, and the world’s most poisonous mushroom is spreading in BC. The trend is clear – Russia’s softwood lumber production and exports are displacing Canadian and Nordic production to China, despite slowing market conditions. In related news, Madison’s says North American softwood production and demand are coming into balance. 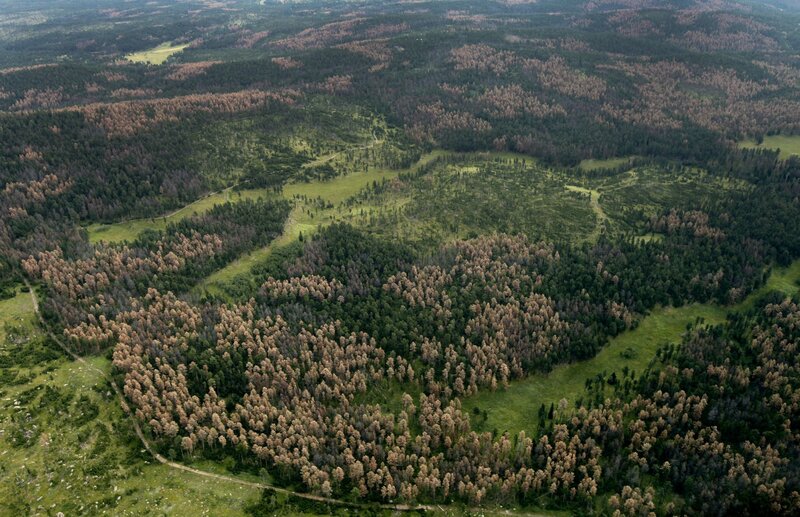 In Forestry/Climate news: the Narwhal reports on why Canada’s Boreal forest is important, and NRDC’s study on the risk represented by our voracious use of toilet paper. Elsewhere: the government of Canada launches a fund to protect species at risk; some logging strategies increase lichen growth for BC Caribou; Washington’s plastic grocery bag ban comes with a charge for paper bags; and the Guardian says if concrete was a country it would be the third largest carbon emitter in the world. 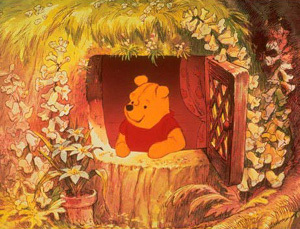 Finally, warm weather is fueling fires through the famed ‘Winnie the Pooh‘ forest. The number of homes being built in December plunged to the lowest level in more than two years, a possible sign that developers are anticipating fewer new houses to be sold this year. The Commerce Department that housing starts fell 11.2 percent in December from the previous month to a seasonally adjusted annual rate of 1.08 million. This is the slowest pace of construction since September 2016. …December’s decline occurred for single-family houses and apartment buildings. …The housing market initially cooled last year as average, 30-year mortgage rates climbed to nearly 5 percent. …But the average mortgage has fallen since November, and that may help some Americans to become owners in 2019. Also, the pace of rising prices has slowed while wage growth has accelerated in recent months, which could also boost sales. Prices of a few standard construction framing North American softwood lumber commodities did bounce up last week, but overall most of the market stayed flat. New orders were encouraging if not guarded, as end-users did their best to survive on existing inventories rather than ordering beyond immediate needs in fear of prices dropping again. This is usually the time of year for growing inventories; when U.S. home builders stock up on supplies needed for spring construction projects. …As sales volumes dropped further this week, Canadian WSPF producers felt production and demand were coming into balance. Recent cold weather has slowed down consumption of framing lumber in North American markets, but sawmills have also curtailed their production. …From the point of view of secondary suppliers, the U.S. Northeastern lumber market went further into “hibernation” last week, said Eastern stocking wholesalers. The voracious use of toilet paper in the United States — with the average American using almost three rolls each week and major manufacturers spurning alternative fibres — is destroying Canada’s forests and causing widespread environmental damage, two international environmental groups say. A report on tissue paper use gave failing grades to the leading toilet paper, tissue and paper towel brands for using only virgin fibre pulp, mostly from Canada’s old boreal forests. “Forests are too vital to flush away,” says the report, called The Issue With Tissue, released Wednesday by Natural Resources Defense Council and Stand.earth, international nonprofit environmental organizations that cooperated on the study. The report hammered the three biggest tissue producers in the U.S. — Procter & Gamble, Georgia-Pacific, and Kimberly-Clark — over their big, recognizable brands such as Charmin, Cottonelle, Brawny, Bounty, Kleenex, Angel Soft, Quilted Northern and Viva. The extent of the impact on shipment numbers at the Westview Wood Pellet Terminal remains uncertain after a fire in Alberta earlier this month. On Feb. 11 a fire and explosion damaged the dryer area at Pinnacle Renewable Energy’s wood pellet production facility in Entwistle, Alta. Pinnacle also owns and ships out of the Westview Wood Pellet Terminal. According to a release from Friday, temporary suspension of operations is ongoing as one contractor remains in hospital. Six employees and five contractors have also been treated for minor injuries. The release said a decision will be made on when full production at the facility will resume following the outcome of the formal investigation still underway by Alberta Labour Occupational Health and Safety (OHS). However, the release added that production from dry fibre is expected to resume sometime in March. Fifteen students from Correlieu Secondary School had an opportunity to gain hands-on experience at West Fraser’s Quesnel sawmill thanks to a partnership between the school, West Fraser and the B.C. Council of Forest Industries. The students… learned about welding, millwright work, electrical, quality control and saw filing. The outing is beneficial for the students, as they get a taste for a variety of jobs, as well as an idea of what the environment is like at Quesnel’s largest employer. “The level of engagement, enthusiasm, interest and passion is very high with these kids,” said Jim Costley, manager of forest education for COFI. …“Fifty per cent of our labour force is going to retire in the next 10 years,” said Costley. Arrow Transportation Systems Inc. has grown exponentially in the last 10 years, and with that, comes expansion in northern B.C. Arrow is constructing a new facility in Prince George, which is expected to be completed by the summer. Jacob Adams, Arrow’s Prince George operations supervisor, says Arrow decided to make the expansion into Prince George because they were able to sign a long-term partnership with Canfor Pulp in the region. …“Once we knew we had a dedicated partner in Canfor who was willing to invest in us and provide us with the work, we started building up our division.” Over the past year, Arrow has hired close to 70 people. …Adams says Arrow invested about $3 million into the new facility. VANCOUVER, BC — Mercer International is proud to announce that Mercer Peace River Pulp has been recognized as one of the top 75 employers in Alberta. “This recognition is a reflection of the exceptional performance of the organization and its team members,” stated Mercer President and CEO, David Gandossi. Mr. Gandossi continued “Mercer Peace River Pulp Ltd. is a workforce that not only leads the industry with the highest standards in health and safety and performance management, but it exemplifies how to do so consistently.” Alberta’s Top Employers recognizes leading organizations who demonstrate strong performance along with the ability to attract and retain high‐performing talent. KINGSEY FALLS, QC – Cascades Inc., a leader in the recovery and manufacturing of green packaging and tissue products, announces the definitive closure of its tissue paper machines located in Whitbyand Scarborough (Progress Avenue) in Ontario. The leases for these two plants expire on August 27, 2019 and will not be renewed. The end date of the production remains to be determined. In total, the sites produce 44,000 tonnes of tissue paper annually and employ 68 workers. “Today, we are announcing the closure of two paper machines in Ontario. Their unprofitability and the current market conditions have convinced us that it is better to source externally to supply our needs. It is important to note that this decision will have no impact on our ability to serve our customers, “said Jean Jobin, President and Chief Operating Officer of Cascades Tissue Group. The grand chief of the Nishnawbe Aski Nation is cautiously welcoming a proposal… after Premier Doug Ford’s government announced a public consultation to repeal legislation adopted by the former provincial Liberal government that gave First Nations some control over development in their traditional territories. The government said that it was proposing to repeal the law with the aim of “reducing red tape and restrictions on important economic development projects” in the northern part of the province, including the Ring of Fire, all-season roads and electrical transmission projects. This objective has… one critic who described the review as a plan to get “First Nations out of the way” to facilitate industry and government’s mining aspirations. …Natural Resources and Forestry Minister John Yakabuski… “We have heard that the act limits development in the Far North of Ontario, where there is so much potential for economic growth and prosperity”. FORT FRANCES — After taking time over the past two weeks to consider a warning letter from Resolute Forest Products, and to hear community input, town council in Fort Frances has passed a slightly-altered motion directed at Resolute and the Ontario government. Councillors Monday night unanimously approved the resolution which “demands” that the company allow bidders for its idled paper mill to negotiate with the province, and that it agree to “engage in a process” to provide access to wood fibre from the forest that supplied the mill when it was operating. Although Resolute’s lawyers had cautioned the town that they considered parts of the motion defamatory, the wording of the version passed Monday is substantially the same as the original text. PULLMAN, Wash. – Washington State University researchers are working with a Port Angeles nonprofit organization to develop new housing materials from heat-treated wood and recycled carbon fiber used in Boeing airplanes. Researchers from WSU’s Composite Materials and Engineering Center (CMEC) are assisting the Composites Recycling Technology Center (CRTC) in Port Angeles to produce construction-grade cross-laminated timber (CLT). A demonstration panel for the first phase of the project will be on display from March 19-21 at the 2019 International Mass Timber Conference in Portland, Ore. Cross-laminated timber is a relatively new building material in the U.S. that has significant advantages in sustainability over many traditional housing materials, said Don Bender, CMEC director and Weyerhaeuser Distinguished Professor in the Department of Civil and Environmental Engineering, who is the lead investigator for WSU. PULLMAN, Wash. – Washington State University researchers are working with a Port Angeles nonprofit organization to develop new housing materials from heat-treated wood and recycled carbon fiber used in Boeing airplanes. 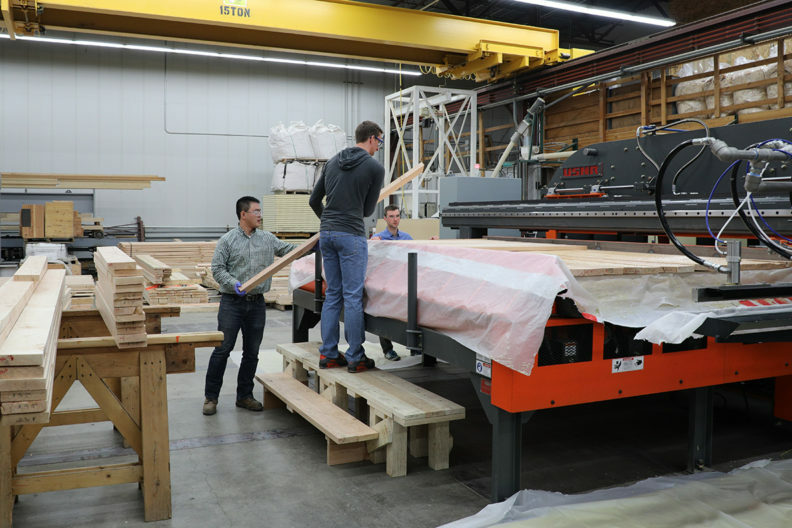 Researchers from WSU’s Composite Materials and Engineering Center are assisting the Composites Recycling Technology Center in Port Angeles to produce construction-grade cross-laminated timber. 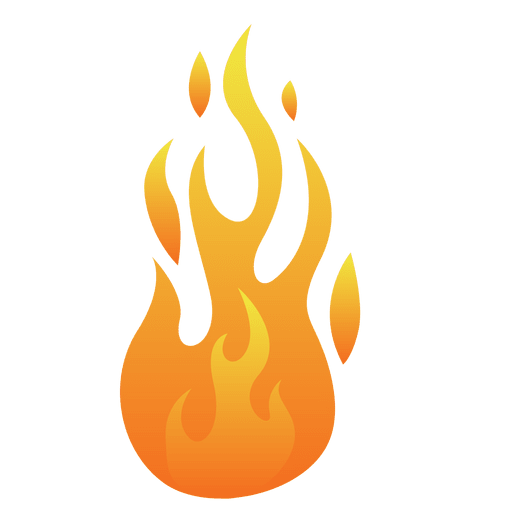 …To convert the timber to a more durable, stable construction material, the researchers are investigating thermally modified lumber. Thermal modification makes the wood more resistant to decay, and less prone to shrinking and swelling as the moisture conditions change. …The first real-world application for the carbon fiber-reinforced wood composite created for the project will likely be military housing. The project’s end goal is development of a new manufacturing facility on the Olympic Peninsula, which could create as much as 50 new jobs in the region. Australia is only behind the US in building the biggest freestanding houses in the world at an average of 230.8 square metres. …So is bigger always better? One Melbourne-based business is proving that it is not, with an innovative housing concept that addresses key issues such as affordability and youth homelessness as well as environmental sustainability, thanks to certified timber from Responsible Wood. 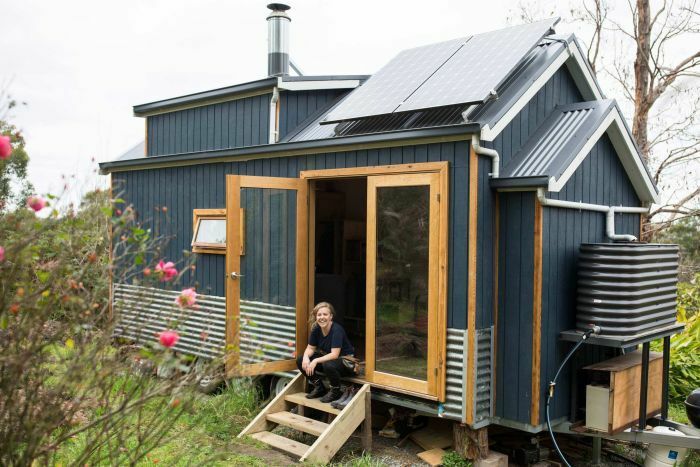 This ‘tiny home’ business began with international architects Grimshaw winning a cubby house design competition held by Kids Under Cover in 2017. …Timber is used extensively in The Peak’s design with the structure comprising of sustainably sourced Laminated Veneer Lumber with some metal external wall cladding while the angle of the roof allows for optimal photovoltaic performance. BOSTON — Sappi Limited is pleased to announce that it has joined the Sustainable Apparel Coalition (SAC) and will use the group’s sustainability measurement suite of tools, the Higg Index, to drive environmental and social responsibility throughout its supply chain. With its membership in the SAC, Sappi joins more than 240 global brands, retailers, and manufacturers, which are collectively committed to improving supply chain sustainability in the apparel, footwear, and textile industry. 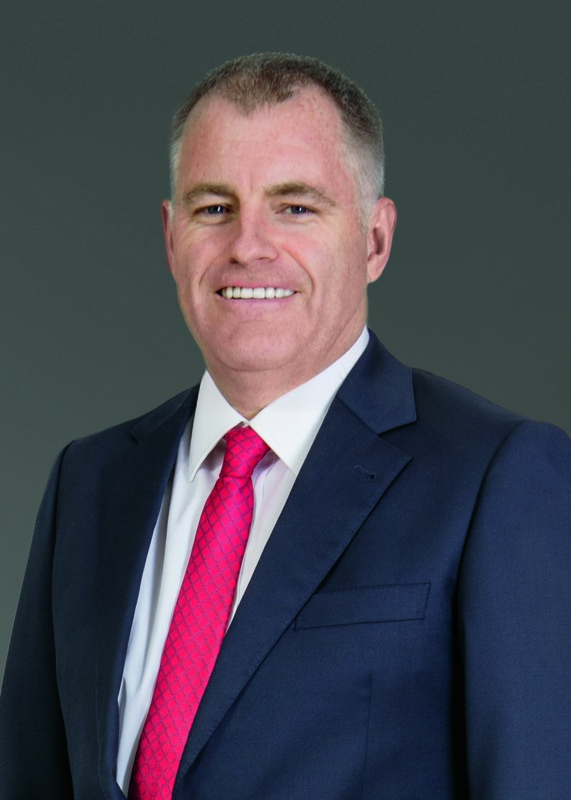 …Sappi Limited CEO Steve Binnie commented: “Sappi’s sustainability strategy… expand our range of products derived from woodfibre, including packaging and speciality papers, woodfibre based bioproducts and importantly dissolving wood pulp for the textiles industry. Concrete is everywhere, but it’s bad for the planet, generating large amounts of carbon dioxide. Creative alternatives are in the pipeline. …Making buildings from wood may seem like a rather medieval idea. But there is a very modern issue that is driving cities and architects to turn to treated timber as a resource: climate change. …Concrete is the second most used substance in the global economy, after water – and one of the world’s biggest single sources of greenhouse gas emissions. …The problem with replacing concrete is that it is so very good at what it does… Chris Cheeseman, at Imperial College London… and is likely to continue to be used. …Using wood, for example, is not straightforward. Wood absorbs moisture from the air and is susceptible to rot and pests, not to mention fire. As the world’s ecological crisis becomes better understood, the boreal forest is becoming somewhat of a celebrity because of one jaw-dropping stat: the Canadian boreal represents 25 per cent of the planet’s remaining intact forest, leading the world alongside the Amazon. What’s more, around 80 per cent of Canada’s boreal is still relatively intact — a rare thing in today’s world. But the boreal is facing threats from logging, mining, fires, pests and the many ways those factors interact with climate change. …The boreal is one of our best hopes for mitigating the effects of climate change and keeping the Earth habitable. Yet it also houses huge deposits of oil and gas and minerals. The decisions being made to protect or exploit it could have repercussions for generations. …The boreal is also a globally significant carbon bank… almost twice as much as what’s stored in tropical forests. …For nearly six years, Syncrude has been trying to turn the site into a fen, a type of wetland with a peaty soil ideal for storing carbon. Like a sponge, the landscape filters water and stores it for dry periods. It is considered vital to the health of the boreal forest. …Through interviews and an email exchange, Skinner discusses how an oilsands company begins a reclamation project. …How do you prepare for the reclamation process? …What do you have to watch for when it is time to replant? Since we are reclaiming the area back to a boreal forest, we need to ensure we have the right species of trees and shrubs available. Our reclamation planning team goes out on the land and collects the seeds we need. A new woodlot north of Maplehurst Park has trail users worried that part of a community trail network could be obliterated by logging. The forest covered hills that straddle Kitsuksis Creek in the Alberni-Clayoquot Regional District (ACRD) contain a network of trails and footbridges built by volunteers… A large section of the Maplehurst trail loops north of the park through the newly designated woodlot, a common form of forest tenure in Crown timber around B.C. communities. 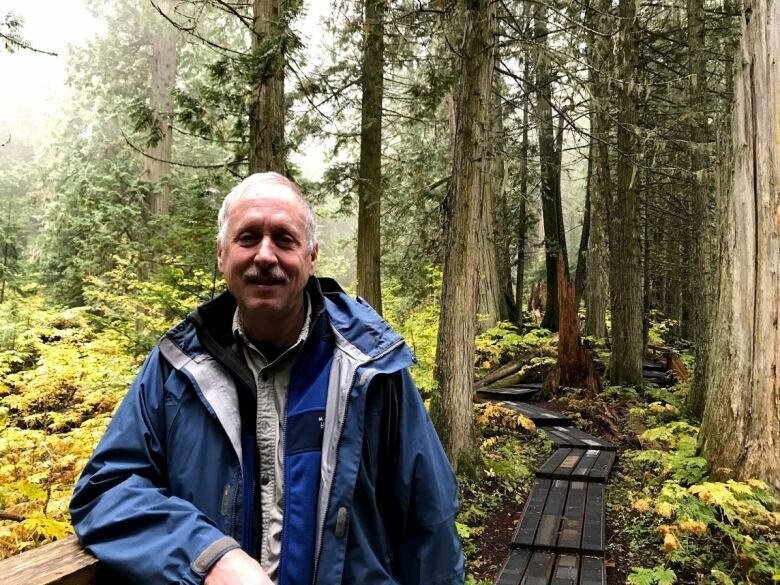 …Greenmax Resources of Port Alberni is the licensee of the Kitsuksis woodlot, referred to as Unit C, a 99-hectare parcel that replaces land removed from the company’s woodlot to allow expansion of Alberni Valley Regional Airport. Owner Dave McBride, holidaying in New Zealand, explained via email that current consultations with the public and local First Nations represent the culmination of a five-year replacement process. Caribou are an iconic Canadian species, appearing on the Canadian 25 cent coin. With their tall and flat antlers, they are the only members of the deer family where the males and females both have antlers. While they are more broadly known globally as “reindeer,” we more commonly refer to the species as caribou in North America. In 2012, woodland caribou in Canada were listed in the federal Species at Risk Act (SARA), triggering a sequence of recovery plans for this species. …For decades, our foresters and biologists have been observing and tracking caribou along with the government of Alberta and BC. By gathering this scientific data, we can research and apply better forest management practices for caribou. …Back in 1997, West Fraser, along with several other forest product companies and the University of Alberta conducted a study … to see how we could limit disturbance of mature lichen and improve lichen growth after harvesting trees. Thunder Bay, Ont.—On February 26, Natural Resources Canada’s Canadian Forest Service, Lakehead University and Confederation College signed a five-year Memorandum of Understanding with Forest Science Research and Education. …The MOU is aimed at increasing opportunities for all organizations to share expertise and resources in forest science and related research, collaboration and education initiatives. It recognizes the potential for this relationship to assist each organization in strengthening forest science research, education, and commercial development in Canada. “On behalf of the Canadian Forest Service, we are excited to further strengthen our relationship with  Lakehead University and Confederation College through this memorandum of understanding. This MOU represents our mutual support for the advancement of forest science research and education within our respective organizations and throughout Canada,” said Dr. David Nanang, Director General, Canadian Forest Service-Great Lakes Forestry Centre. Alvinston, Ontario — The South West Woodlot Association will host their annual general meeting in Alvinston this weekend, in part to educate people interested in restoring and preserving forests and nature in the region. …The local woodlot association is less a lobby group and more a boots-on-the-ground collection of 50 to 60 individuals, some associated with conservation authorities. Tim Payne, manager of forestry with the St. Clair Region Conservation Authority, for instance, is also a technical adviser for the South West Woodlot Association. WALTON, New York — Loggers in snowy forests are cutting down ash like there’s no tomorrow, seeking to stay one step ahead of a fast-spreading beetle killing the tree in dozens of states. The emerald ash borer has been chewing its way through trees from Maine to Colorado for about two decades, devastating a species prized for yielding a light-grained hardwood attractive enough for furniture and resilient enough for baseball bats. Many hard-hit areas are east of the Mississippi River and north of the Mason-Dixon Line. Some fear areas in the invasion zone like upstate New York might have only five to seven years of ash logging left. 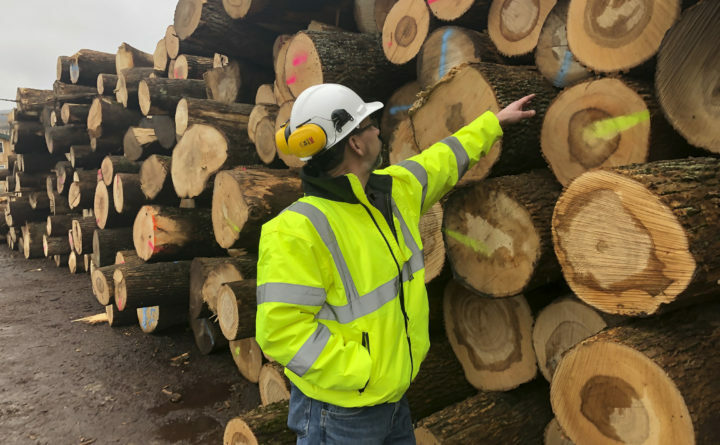 “Emerald ash borer is probably the most thorough killing machine that we’ve come across in my career over the last 35 years,” said Tom Gerow, general manager for The Wagner Companies, which specializes in furniture-grade lumber. In the wake of potential job losses at Eden’s Blue Ridge Hardwoods and ongoing concern with native forestry, the Member for Eden-Monaro is suggesting a shake-up of the timber industry. “Our native forests could very well potentially hold more value as carbon sinks and in ecotourism, perhaps alongside some selective sustainable logging activity,” Mike Kelly says. Speaking with Region Media, Dr Kelly made the comments in connection with questions about the current harvesting operation underway near the historic Corn Trail in the Monga National Park near Buckenbowra State Forest. “Labor is keen to pursue the establishment of a Timber Hub for the region which would include funding to establish a timber co-op that engages local farmers to assign portions of their property to plantation development, this would help them diversify their income,” Dr Kelly says. The Institute of Foresters of Australia (IFA) has called on the Victorian Government to fully explain why it is refusing to release pre-designated wood production forest to the timber industry. Mark Poynter, a Fellow of the IFA in Victoria said, ‘Victorian Premier Andrews’ explanation that the delay in releasing this timber is due to the importance of “following the process to get the planning right” is hard to fathom, given that the Timber Release Plan has been ready for signing since before last November’s state election. …‘Under these circumstances, we would expect timber production to continue while this review was conducted. 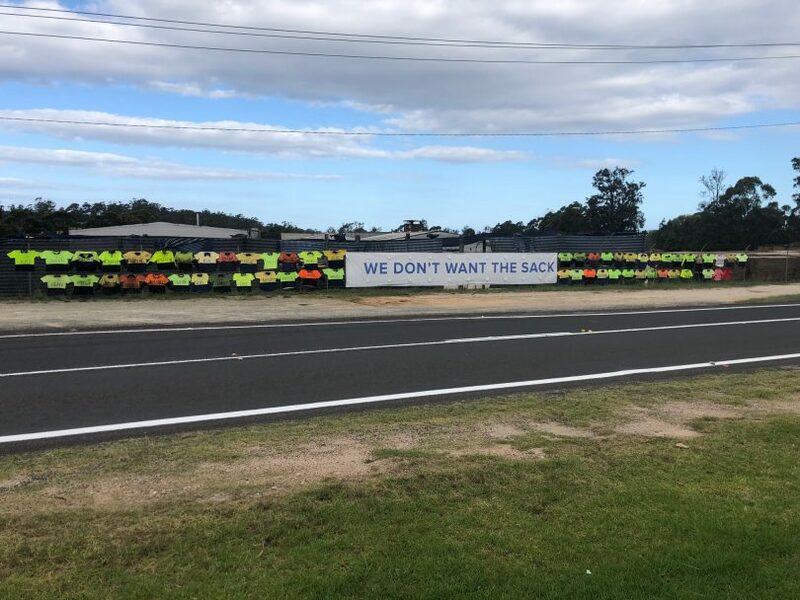 Stopping an industry dead in its tracks while formulating a strategy for its future is unprecedented and guaranteed to create an employment crisis for regions and rural communities. …A tiny wasp, Eadya daenerys, can now be used in New Zealand to combat the destructive eucalyptus tortoise beetle (Paropsis charybdis). A decision-making committee appointed by the Environmental Protection Authority (EPA) has approved an application to release the parasitoid wasp in New Zealand. …The application was lodged by Scion, the Crown Research Institute focused on research, science and technological development for the forestry and timber industries. The EPA’s… Dr Fiona Thomson-Carter says “Eucalypts are an important component of our forestry industry; and in the landscape gums provide shelter, floral nectar resources for birds and bees, erosion control on steep land, and increased biodiversity. …“The deliberate use of natural enemies to reduce pest populations can be a very cost effective and reduce the need for chemical insecticides. BC’s new Climate Change Strategy outlines many ways to reduce emissions, but it skates around the forest sector. Premier Horgan’s recent forest policy announcement didn’t even mention forestry’s key role. Forests fix and store huge amounts of carbon, and forestry is by far the biggest source of carbon emissions in BC. Yet the unruly dynamics of forest carbon are not fully reported in provincial emissions totals. The standard voodoo accounting treats forestry as carbon neutral, not counting its emissions as GHGs because in theory the trees will grow back. Even if it would take until 2100 and beyond for newly logged forests to recover their carbon stocks. BC’s forest carbon strategy favours accelerated logging, more wood products, and more bioenergy. …Questionable claims about forestry and climate change will probably be invoked in support of this strategy. B.C.’s Ministry of Public Safety has approved approximately $1.5 million in funding for evacuation route planning to 60 local and regional governments and First Nations communities. Each of the communities and governments will be receiving up to $25,000 each through the province’s Community Emergency Preparedness Fund, bringing the total granted successful applicants all over the province to more than $17 million since September 2017. That’s just over halfway to the $33.5-million allocated by the government to help communities prepare for and respond to disasters. “We can’t predict exactly when a disaster may hit, but we can help our partners prepare so that if people have to be evacuated, they’re doing so in the safest, best way possible,” said Solicitor General Mike Farnworth. World’s most poisonous mushroom spreading in B.C. The world’s most poisonous mushroom is spreading in British Columbia, according to a recent article in the B.C. Medical Journal. The publication is alerting doctors, nurses and pharmacists to the dangers of people consuming Amanita phalloides, commonly known as the death cap mushroom, as well as to their roles in preventing related deaths. “Healthcare providers need to be aware of the risk, as prompt recognition and appropriate management are critical for positive patient outcomes,” said authors of the article, Maxwell Moor-Smith, Raymond Li and Omar Ahmad. The death cap is not native to Canada and was brought to B.C. on the roots of imported European trees. Since the first death cap specimen was found and collected in B.C. in 1997, there have been numerous sightings of the mushrooms in the Fraser Valley, southern Vancouver Island and the Gulf Islands.